Ministry of Education, Primary Education of the Government of the People’s Republic of Bangladesh, the priority policy for the post-secondary sector and related administration for development. This Ministry mainly implements and enforces the implementation of secondary and higher secondary education in the country including madrasa, technical and vocational education system. The notification for direct recruitment has been published in the following posts of Prime Minister’s Education Assistance Trust. This appointment will be given to two posts. Interested candidates can apply online. Both men and women can apply in the posts. You can also apply if you have interests and qualifications. Full notification details are provided. Educational qualification: Bachelor or equivalent degree in Computer Science / Computer Science and Engineering / Electrical and Electronics Engineering / Information and Communication Technology related subjects. Educational Qualification: Postgraduate or equivalent degree in Commerce Department or second grade graduation (Honors) degree. 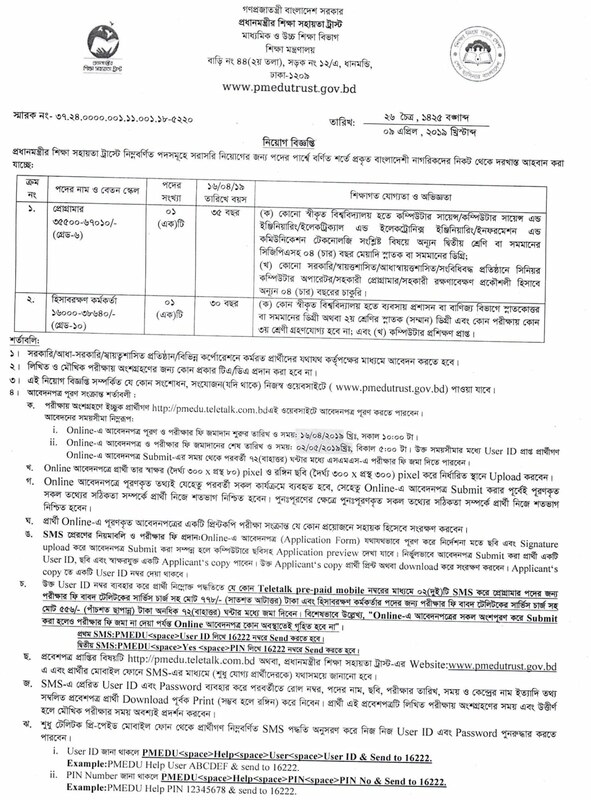 Job Description: Ministry Of Education is a very fascinating job circular in Bangladesh.